The Gulf fritillary or passion butterfly (Agraulis vanillae) is a bright orange butterfly of the family Nymphalidae and subfamily Heliconiinae. That subfamily was formerly set apart as a separate family, the Heliconiidae. 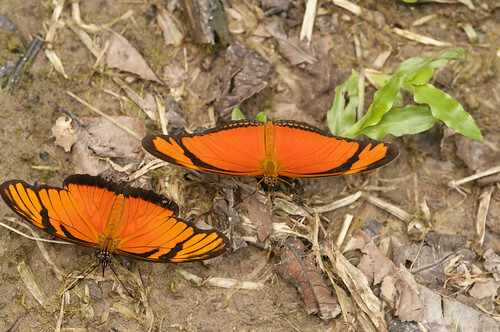 The Heliconiinae are "longwing butterflies", and like other longwings this species does have long, rather narrow wings in comparison with other butterflies. Dryas iulia (often incorrectly spelled julia), commonly called the Julia Butterfly, Julia Heliconian, The Flame, or Flambeau, is a species of brush-footed butterfly. The sole representative of its genus Dryas, it is native from Brazil to southern Texas and Florida, and in summer can sometimes be found as far north as eastern Nebraska. Over 15 subspecies have been described. Two Julia Butterflies drinking the tears from the turtles in Ecuador Its wingspan ranges from 82 to 92 mm, and it is colored orange (brighter in male specimens) with black markings; this species is somewhat unpalatable to birds and belongs to the "orange" Batesian Mimicry mimic complex. Dryas iulia is a fast flier and frequents clearings, paths, and margins of forests and woodlands. It feeds on the nectar of flowers, such as lantanas (Lantana) and Shepherd's-needle (Scandix pecten-veneris), and the tears of caiman, the eye of which the butterfly irritates to produce tears.